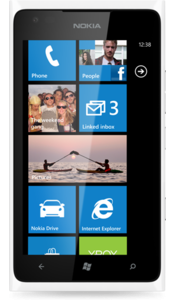 Nokia Lumia 900 - smartphone which has a large AMOLED-display with a diagonal of 4.3 inches with a resolution of 480x800. It installed with the operating system MS Windows Phone 7.5. The camera it has 8 megapixels, there is a led flash, auto focus. Built-in memory of 16 GB. There is the support of Bluetooth, Wi-Fi, 3G, LTE, GPS, GLONASS. The battery in his powerful 1830 mAh.